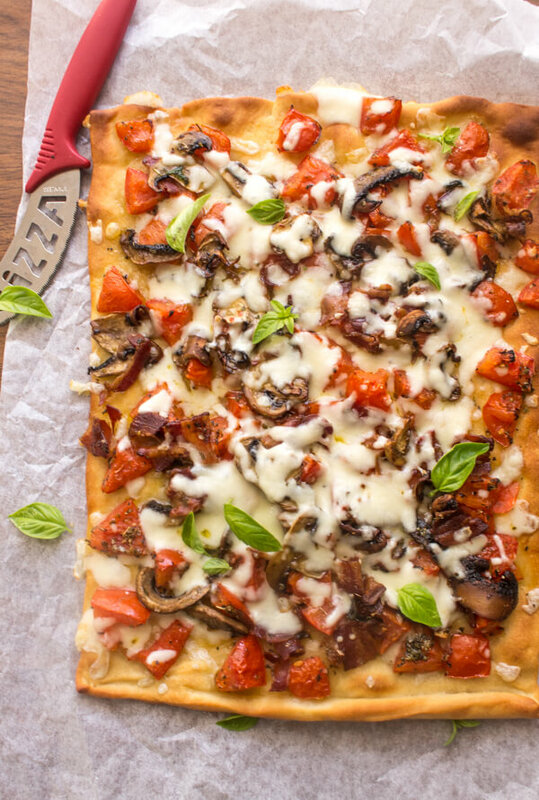 Cheesy Sautéed Mushroom Pancetta Pizza, the perfect anytime Pizza, made with perfectly spiced sautéed mushrooms, fresh tomatoes and mozzarella. Pizza Perfect! So it’s the weekend, in December. It’s cold outside, and what do you want for supper? Pizza of course. But not any kind of Pizza! 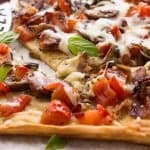 How about a delicious Homemade Mushroom Pancetta Pizza? If there is one thing we all agree on it’s Pizza on the weekend. From a plain Tomato Pizza to an Italian Sausage with Artichokes and Cheese to one of my favourites, Grilled Zucchini Pizza with Ruccola. I love Ruccola, in salads on smoked salmon everywhere! And if you have the urge to make your own dough, this is one of the best Homemade Pizza Doughs I have ever made or eaten. Although, sometimes we get the urge for pizza at the last minute, and there isn’t time for homemade dough so I usually buy a good store bought or even pick up some dough at the local bakery. You could probably check out your nearest pizzeria, I have done that back home, with no problem, picking up a pound or two of dough. So yes, this Sautéed Mushroom Pancetta Pizza was last minute, I actually got the urge while grocery shopping. 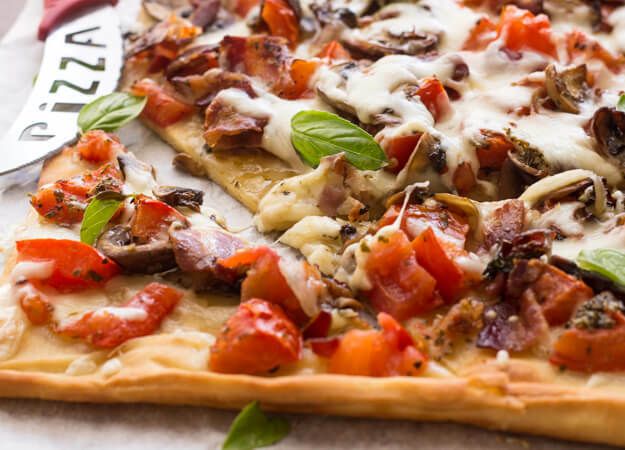 We love the combination of mushrooms and pancetta, throw on a little oregano and parsley, cook it up with some olive oil and you have the perfect topping for your Pizza. I also decided to use a few fresh tomatoes, seeded and chopped, I much prefer that to the canned sauce. 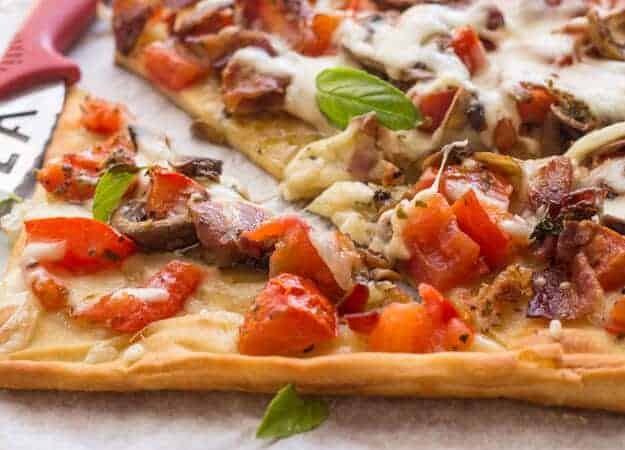 Serve this Cheesy Sautéed Mushroom Pancetta Pizza with a nice green salad and there you have your weekend dinner, you can thank me later! Happy Weekend and Buon Appetito! 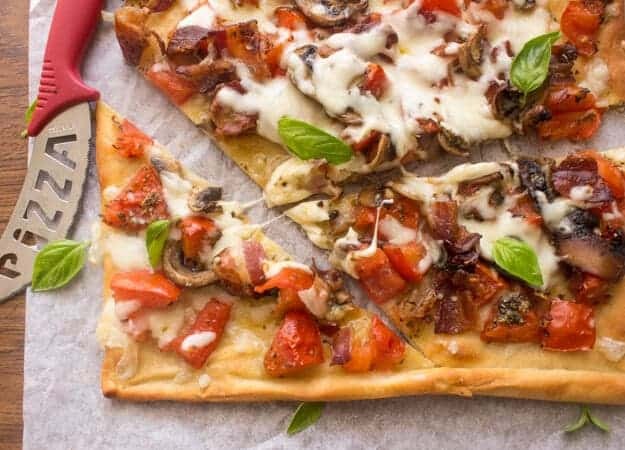 Cheesy Sautéed Mushroom Pancetta Pizza, the perfect ingredients to make the best Family night quick and easy Pizza. Italian at it's best. Pre-heat oven to 450°. Lightly grease a large pizza pan. In a medium frying pan add 2 tablespoons olive oil, sliced mushrooms and pancetta add 1/2 teaspoon oregano, 1/4 teaspoon salt, parsley, thyme and hot pepper flakes if desired. 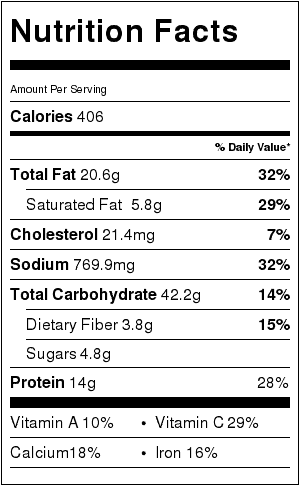 Sauté for approximately 10-15 minutes on medium. In a medium bowl toss together, chopped and seeded tomatoes, 1/2 teaspoon oregano, 1/4 teaspoon salt, 1/2 teaspoon basil and 1 tablespoon olive oil. 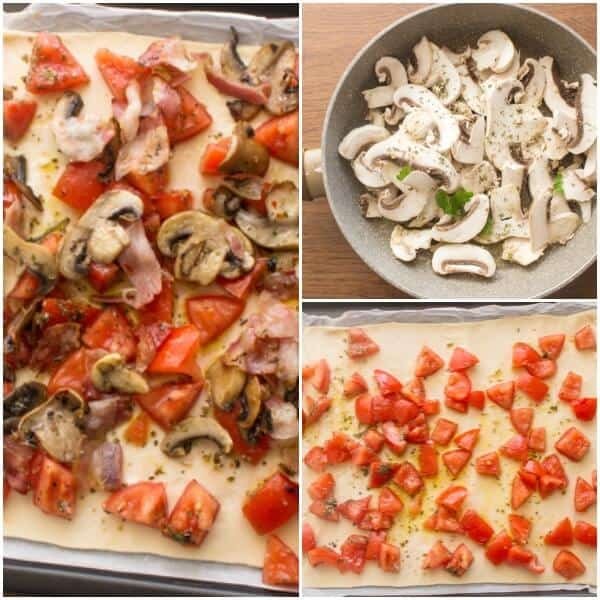 Roll out pizza dough and place on prepared pizza pan, cover with tomato mixture and mushroom mixture. Bake for approximately 10-15 minutes or until crust is baked. Remove from oven and immediately top with shredded mozzarella and bake for another 2-3 minutes or until cheese has melted. Serve and Enjoy! This looks wonderful! I bet your family was super happy that you decided to make this! !